Hey did this work for you in the game? I did this too but I encountered that the game always crashed for me in game. It loaded but always crashed when I came around end of IJ/PV location. Yeah, it works fine in CE. I had the exact same crash at that location, which was caused by presumably too many terrain vertices - specifically, it was the rock steps from IJ. They're waaaaay too high-detail. 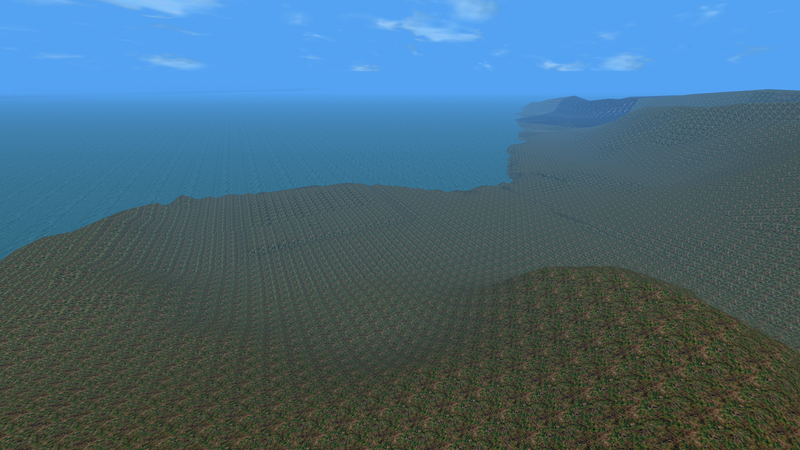 I was able to significantly optimize that area and the crashing problem went away. 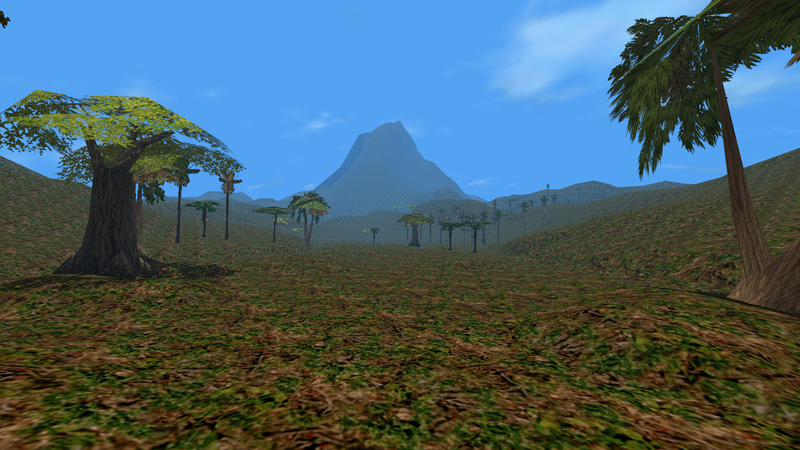 It seems that Trespasser has difficulty rendering a heightmap this large when there is a lot of detail going on. I guess so, but then it's really no fun if you can look but not touch. I believe that it COULD be done, but there would have to be a great sacrifice in terms of flora and rocks. It actually wouldn't be too bad if the flora were completely redone by hand because then we would be able to better choose the detail resolution in areas and avoid all of those unnecessary huge clumps of tiny plants. I'm not really willing to do that though, what with all the other stuff I'm currently busy with. I had to get rid of the second little ridge thing in PH, which is fine because it was completely unnecessary. It now looks like the riverbed in IJ ends with a tiny, dried-up waterfall that would once have flown into PH's main stream. Of course how exactly you were meant to cross this little gap is a bit of a mystery, but a simple box could get you up the lip and into IJ. Now that the old IJ was imported, I noticed that there is very little in the way of transition between the Blighted Forest area and the ending valley...there's just sort of a hill in between that looks un-climbable. Drawing inspiration from the walkthrough, I decided to cut the rock steps out of retail IJ and paste them into the hill so that there is a bit more of a clear path and challenge in proceeding through this area. I think it fits pretty well! Finally, just for completion's sake, I added in the fixed coast area of the PCGamer Pine Valley level, with the completed stream. I kept the height of the cliffs as it were in the beta because otherwise the ocean would flood the harbor area, so there was a little bit of patching to do in order to align the retail stream's end with the one from the PCGamer level. It's really hard for me in places to avoid digging out roads and new areas as there is a ton of unused space on Isla Sorna. I might rough out the rest of the island at some point (the coast is already finished), but I don't think Tres could handle the amount of objects that it would take to cover another ~30% of the island. Retail Beach into Jungle Road. 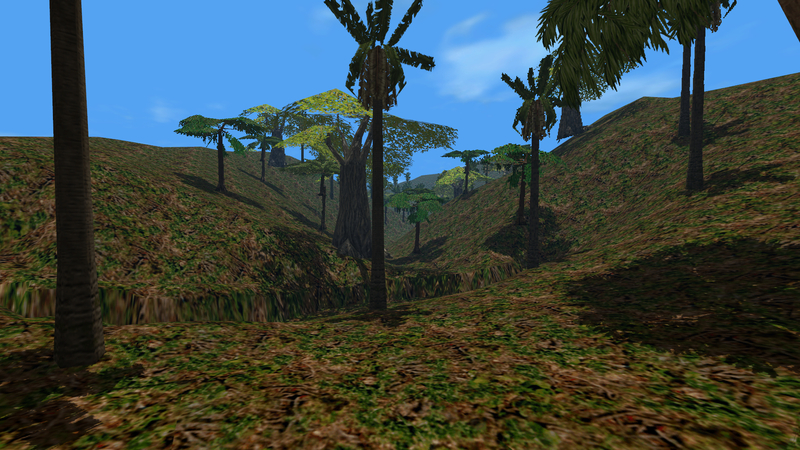 My Jungle Road is mostly from the PCGamer release, but a few areas are spliced in from the early alpha to get rid of some very ugly, rough terrain - this is most noticeable in the "final exam" valley, as well as the big open area between the Mayan Pavillion and the monorail. From the Mayan Pavillion, looking east toward Beach. The end of Jungle Road looking into Plantation House and north across the island. Need to tweak the fog some more so that Mount Watson is a bit more visible. 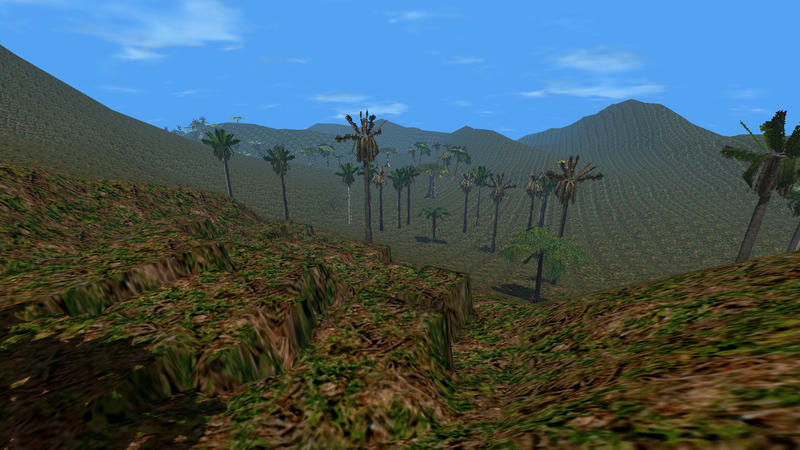 The Blighted Forest's view of Mount Watson. The rock steps are faintly visible on the right. View from the plains north toward the completed Mount Watson. South-west from the top of Pine Valley, with the updated Industrial Jungle visible. 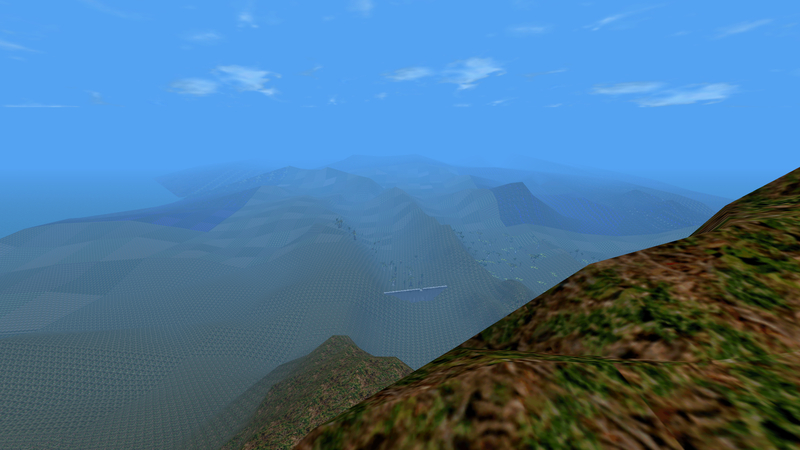 The lack of that huge cliff allows for a much more spectacular view. Lab with an actual ending. 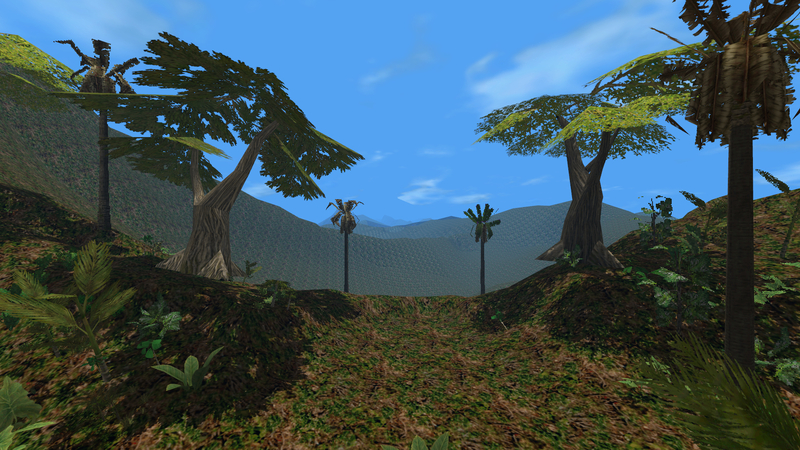 This area required a ton of fixing because the terrain was so different in places. I also touched up the really rough terrain in the first half of Ascent 1 so that there are no more pits where you can get trapped. This is where the "View of the Island" music plays. Now you can actually see all the way across the island, though that really ugly distant terrain is very evident from up here. I'll have to figure out how to get around that bug. I'd also like to add the missing road from this area that seemingly was intended to go down the southern face of Mount Watson and perhaps meet up with the Pine Valley road right where the gate is since it makes no sense for the road to just end. If I was a bit less terrified of Trespasser's stability, I'd love to add in a real area between the southern gate of the Town and the plains area to represent the Plains level, as well as add in areas where I could conceivably more levels existing. 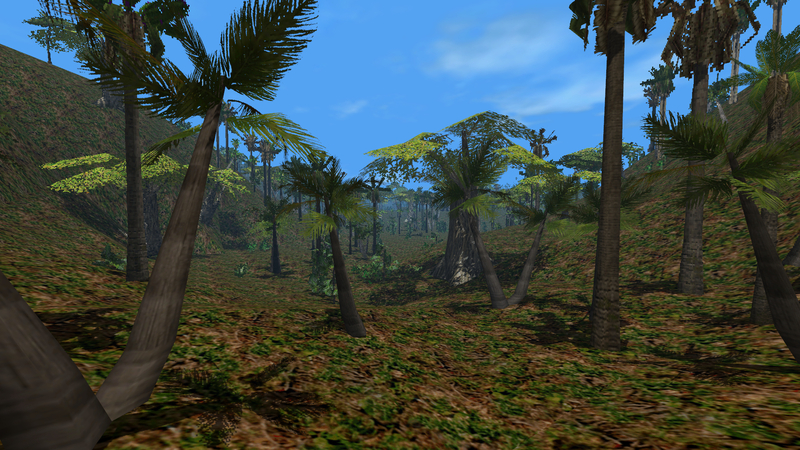 I might give it a go in a separate version of the level just to see a "complete" Isla Sorna and show the results here. Looks nice.. Dunno if Tres can handle it. Hey, TI, would you mind sending me a copy of the level for me to look at? I know much of your Tres time is focused on RTJP, so I wouldn't want you to get overly sidetracked with other projects. I just wanna test out my own experiment to see how much can be put into the entire map without rendering it unplayable. Yeah, I think Tres could definitely handle the entire game combined into two levels. Surprisingly, though, it seems that even with most of the plants in BE, JR, PH, IJ, and IT imported, the object count is only around 17000. Which surprises me because I thought for sure there would be way more (and this is without deleting overlapping objects). I have no idea how importing all of the pine trees and plants will contribute to this, but I think it may actually be feasible after all with one level. If I manage to get all of the trees, rocks and other repeatable objects in without getting the object count too high, I would definitely try to import the remainder of the missing objects, followed by the triggers. Could it be that at one point the developers had every single object in a single MAX scene, then split them into separate levels? I think I'd prefer to touch up the island a bit more and release it to the whole community first. Don't worry, this (hopefully) won't take forever. 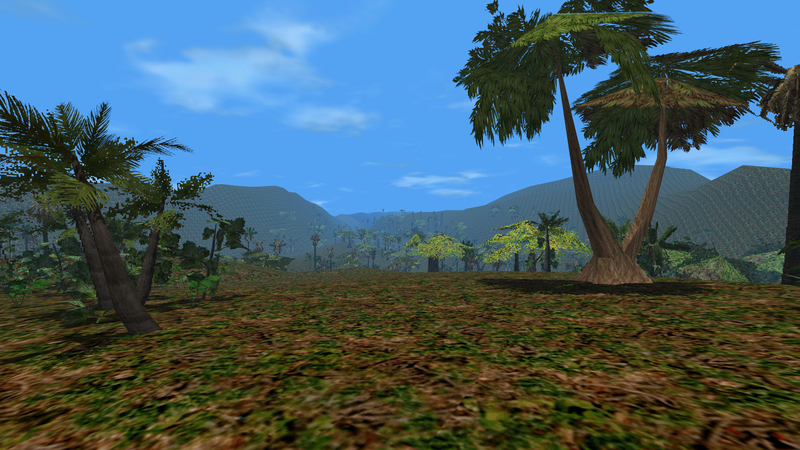 And I have already performed that test using big jungle trees - I was able to hit the object limit (around 65000) without crashing the level. Of course that's not an excellent test considering the low poly count of the trees, but it definitely helps to know the level is stable with that many objects. EDIT: Forgot to mention - I finally implemented a 100% working day/night cycle in the level, with different lighting, shadows, and visibility at each different time of day! There are 12 phases to the cycle, and it repeats once these are finished. The cycle lasts 4 hours, which is a bit more than the amount of time I it usually takes one to complete the game normally, so that you can experience nearly the whole cycle. I tested it out by walking across the entire island (without puzzles) and I reached the Summit after about 2 hours of walking ( ) - by that point the sun had set and it was twilight hour, so I may change around the timescale so that slower players don't have to climb the mountain at night. I DID have screenshots of this, but I deleted them accidentally, so you'll just have to take my word on this for now. Trust me - it's awesome. Could it be that at one point the developers had every single object in a single MAX scene, then split them into separate levels? Based on the max files we have of IT and JR, I would say no. It would be really heavy on the computers back then. As for the trees, there should be no problem. The main issue I believe would be getting a good palette to work alright with all terrain textures, as the lab and town have some colorful ones. 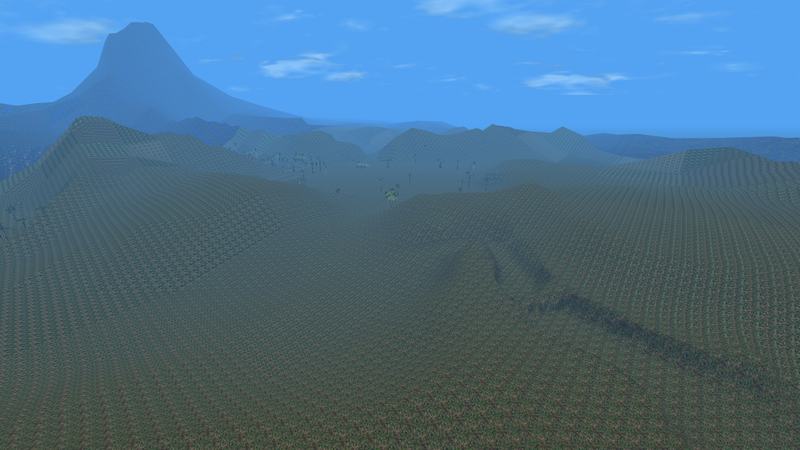 Also, the terrain objects are probably the most in numbers, rather than the foliage and trees. 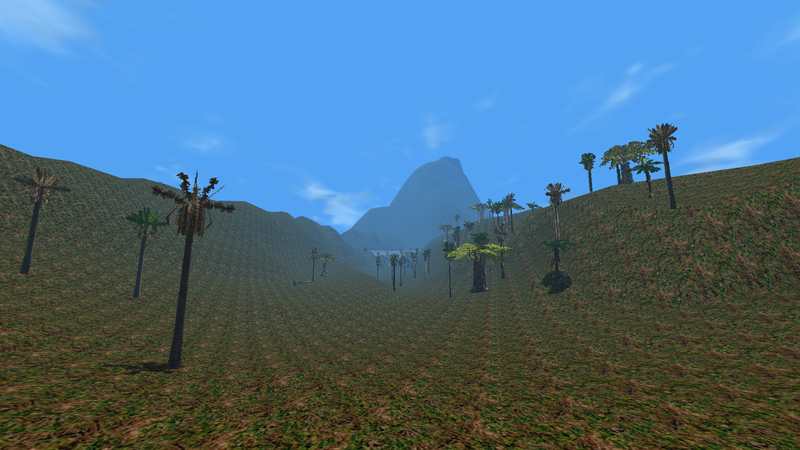 But I would focus on the terrain objects first, as those would look really nice even in an empty level! As for the trees, there should be no problem. The main issue I believe would be getting a good palette to work alright with all terrain textures, as the lab and town have some colorful ones. I managed to make a palette that incorporates a pretty good combination of colors - the only ones that ended up a bit more muted than I would have liked were the ones on the grayish-blue side (underwater mostly), which become gray in the palette but still look reasonable. For the stair like terrain, couldn't you replace that with a model instead, to avoid having to edit the terrain too much? I guess you could, but the edits I made are completely unnoticeable. 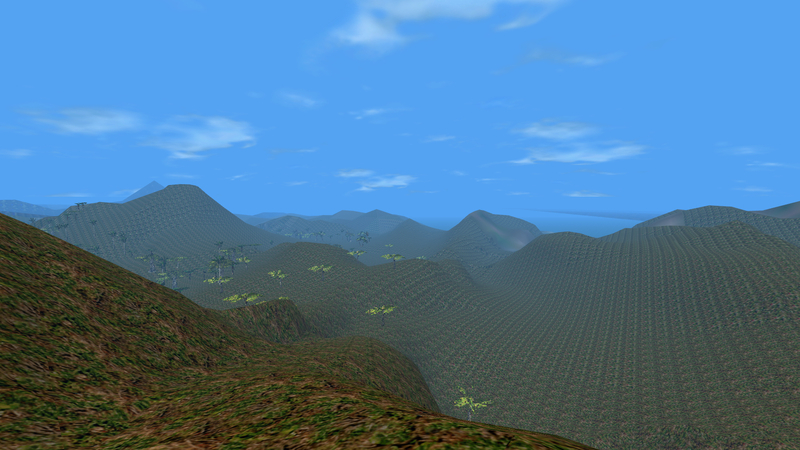 I only got rid of terrain vertices that were unnecessary as there was a lot of flat terrain that could be reduced without losing any quality. 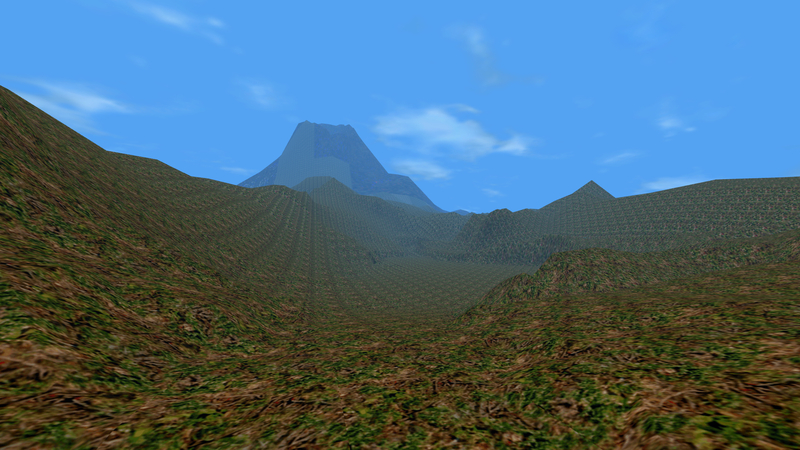 Adding a object instead would make it look weird, as the textures wouldn't look the same as the terrain. It would also be a lot more buggy because of the physics (and you would get stuck etc). That is also true. And besides, it's definitely time that could be better spent elsewhere, such as fixing spikes in the terrain and smoothing out rough areas. Trust me, the rock steps look fine as they are now.